Blue Orange Games is lucky to partner with a fantastic bunch of retailers who are businesses and supportive of our games. We want to do more to recognize the stores and individuals that make our mission possible. 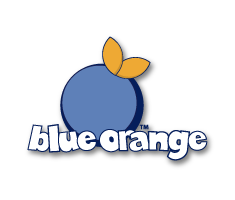 That’s how our monthly spotlight on an outstanding Blue Orange Games retailer came about! 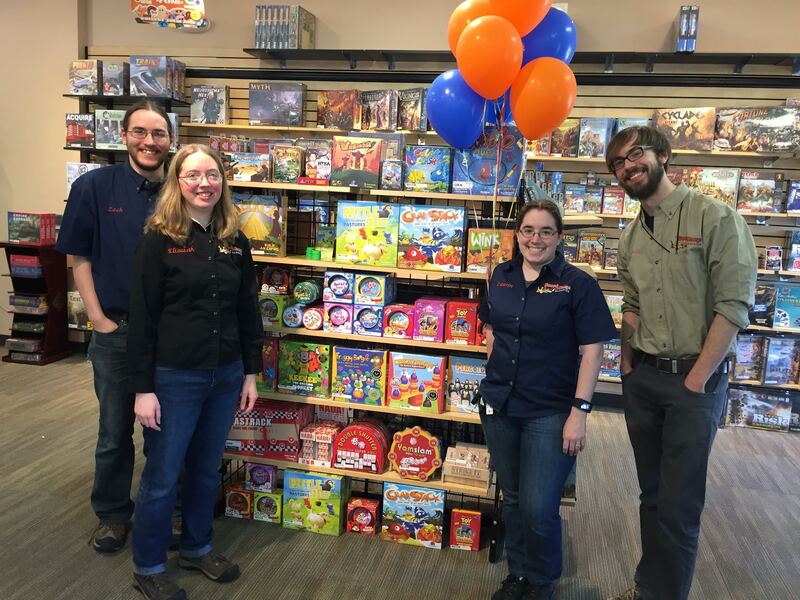 We are pleased to announce that The Board Game Barrister in Glendale, Wisconsin is our Store of the Month for June! Our sales manager, Florian, nominated this store for their excellent work promoting and bringing their customers both gamer games and more family-oriented games. He highly commends the owner, Gordon Lugauer, for the manner in which he handles his business as well as his “perfect knowledge of the industry.” Gordon, whom I had the pleasure of speaking with, first began playing Dungeons and Dragons at the age of five and the game was a persistent and well-loved influence in his life up into junior high school. He also has a long-standing love for abstract strategy games, particularly those made out of wood. It’s no surprise then that he was attracted to one of our first games, Gobblet, when his store was just starting out and felt he had to stock it. 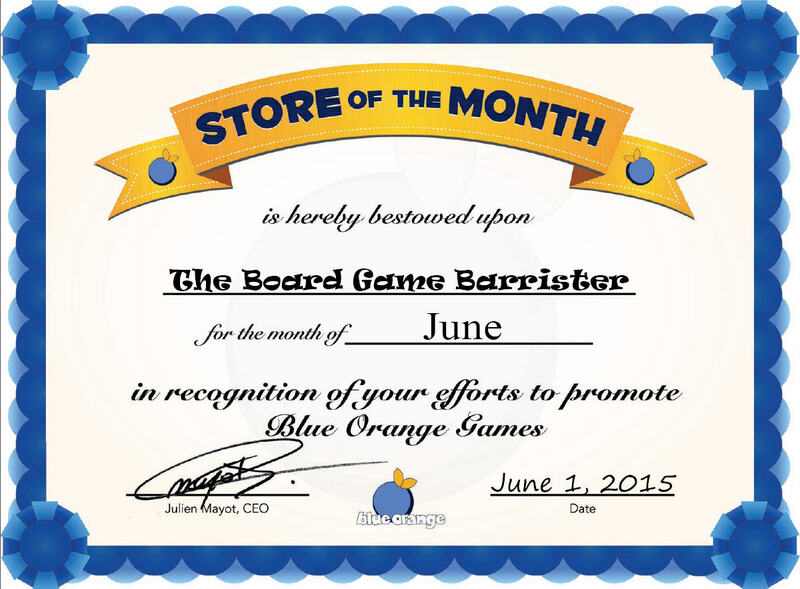 So The Board Game Barrister has been watching and supporting our line since the very beginning which is why they deserve a big THANK YOU from the whole team over here at Blue Orange Games. Gordon didn’t always know he was destined to open a thriving toy store which would become Blue Orange’s Store of the Month! In fact, he started out as a technical consultant and had been studying to become a lawyer when he realized that he wanted to have fun, engaging interactions face to face with people! That’s how, without much preparation, the bright idea hit him to open what he thought would be a part-time addition to his law school studies. He called it the Board Game Barrister because a barrister is a lawyer who advocates for people in the higher courts of law, which is what he was studying to become. Needless to say this “side project” soon took up all of his time and though he always meant to go back to studying law as soon as things at the store hit a plateau, things at The Board Game Barrister just haven’t slowed down! Gordon credits dumb luck that he studied just enough law as is useful for owning your own business and negotiating. He also happens to live above a long-vacated one hundred year old movie theater and conjoined carpet store which he has converted into his toy warehouse. But that’s as far as luck goes; the rest is insight and hard prep work. What makes a toy store successful, Gordon says, is the ability to listen to what his customers want by how they speak through their actions. It’s about getting at the heart of the experience, the feel they get in the store and then also the gameplay and memories they are taking home with them. At his store, it is a “barristers” job to advocate on behalf of the people who are going to receive or play the game and shine a light on the experience a customer would be getting so that they are already equipped mentally to have a good time or to convey that enthusiasm to the person whom they are giving the gift. A good toy store has to nail that mentality or else customers would just buy the game online. It may be hard for our online readers to see the impact of Gordon’s attitude on the store and employees but it is clear that at The Board Game Barrister, they are doing something right. After all the hard work choosing games at Toy Fair and prepping for Christmas like Santa Claus himself, Gordon is blown away by the sheer number of heart-warming interactions his store facilitates during the holiday season and all year round. In particular, one of his favorite things is seeing a new hire really getting ‘it’ by taking the right initiatives and then using that development somewhere positively. He knows his store is doing something right when a past employee says “the things I learned working at The Barrister I use EVERYDAY” and he is very proud of some of them who have moved on to become teachers or are very good in their specific fields. 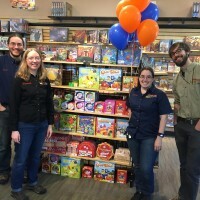 What better way to foster love for your store than to open it up for customers to not only buy the games but also to make fun memories inside of it! Thank you to Board Game Barrister for their continued support and love of Blue Orange Games. If you’re ever in Wisconsin before 11pm on a Friday night and want to play with some “geeky hooligans,” just know that The Board Game Barrister will still be open.